We brought in gardening for business premises as a response to our home services clients who wanted the outdoor areas at their business to benefit from the same standard of gardening work they were getting from us at their residences. At a busy office or building, we know that your premises need to look good on the outside to give the right impression to clients and staff alike. Maintaining the grounds at your business is easy with An Extra Pair Of Hands. A regular check and tidy up from our trained gardening team can be weekly, fortnightly, monthly or seasonally. 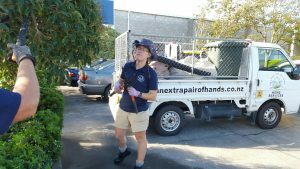 Services include weeding, pruning, planting and spraying, or a general tidy up. Water blasting is also available. Ask us about cleaning the inside of your offices as well. Contact us and we can arrange for our team leader to meet you on site and consult with you to tailor a gardening service particular to your business. A free quote is provided as part of this on-site visit. Our team are trained, and security checked. As a business An Extra Pair of Hands carries full public liability insurance. As with all our services, we can garden at your business premises in Feilding, Palmerston Nth, the Kapiti Coast and Hutt Valley, Wellington and Christchurch.